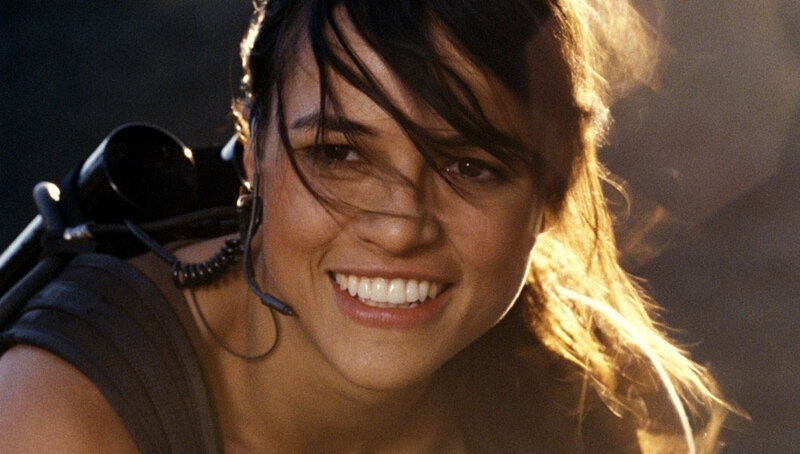 I got very excited when I read that the 4th movie in the “solving-crimes-with-street-car-racing” series, Fast & Furious (2009), would see the original cast reuniting… but I was far less thrilled when I learned that the premature death of M-Rod’s character, ‘Letty’, would be a major plot point. I’ve been boycotting the movie ever since… but it was showing on TV last night, so I thought I’d give it a watch. Lucky for me ITV chose to break it up into two parts, with a news broadcast in the middle, so I was able to record the first half without having to listen to my digibox whirring and clicking away all night! For those (like myself) who are curious about M-Rod’s contribution, here’s how it breaks down: She appears in the opening ten minute prologue, participating in a fantastically absurd high-speed heist sequence, during which she clambers onto a fuel tanker to uncouple the tanks, so that ‘Dom’ (Vin Diesel) and his gang can hijack the precious petrol inside. As they celebrate their success, Dom learns that the cops are closing in on him again, so he sneaks out in the middle of the night, leaving Letty sleeping in bed, oblivious. That’s the last he ever sees of her…. because five minutes later, everyone is attending her funeral! Apparently she was killed off-screen in a car “accident”… and around the twenty minute mark Dom visits the crash site, and has a little “psychic vision” where he sees her lying in her overturned car, being shot by a shadowy gunman… and that’s that. Of course, we never actually see her die for realsies here… so it wouldn’t be any kind of stretch to say that she was still alive. I just wish they’d hurry up and bring her back already! Note: I did actually keep watching after M-Rod’s last scene, because this movie is a pretty pacy piece of eye-catching entertainment… but I won’t be buying the DVD anytime soon. This entry was posted in Rants about Films and tagged Fast & Furious, Michelle Rodriguez, The Fast and the Furious. Bookmark the permalink.